Washington Court House was part of a historical celestial event Monday as residents visited Washington Park to enjoy the first solar eclipse to pass from coast-to-coast in 99 years. 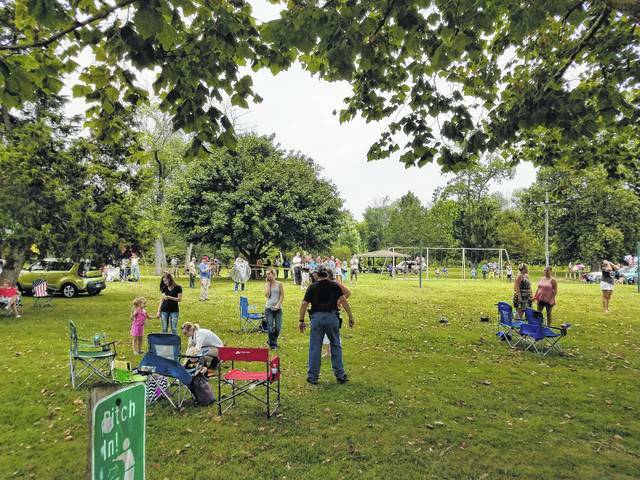 Thanks to Lorre Black, Kris Hellenthal, Leah Ann Wyckoff, and the local Kiwanis Club, the community was treated to a once-in-a-lifetime party called the “Black Sky Project.” Started by Black, a large crowd of locals came together on Monday to enjoy the Great American Eclipse. Black was thankful for the turnout to the event. She said she did not expect to have so many residents coming to watch the eclipse, but was glad to see them come together. “It’s really, really, really, really awesome,” said 9-year-old Cami Smith as she watched the fully eclipsed sun from a gravel lane near her grandfather’s home at Beverly Beach, Oregon. The temperature dropped, birds quieted down, crickets chirped and the stars came out in the middle of the day as the line of darkness raced 2,600 miles (4,200 kilometers) across the continent in about 90 minutes, bringing forth oohs, aahs, shouts and screams. In Boise, Idaho, where the sun was more than 99 percent blocked, people clapped and whooped, and the street lights came on briefly, while in Nashville, Tennessee, people craned their necks at the sky and knocked back longneck beers at Nudie’s Honky Tonk bar. It was the most-observed and most-photographed eclipse in history, with many Americans staking out prime viewing spots and settling onto blankets and lawn chairs to watch, especially along the path of totality — the line of deep shadow created when the sun is completely obscured except for the delicate ring of light known as the corona. The shadow — a corridor just 60 to 70 miles (96 to 113 kilometers) wide — came ashore in Oregon and then traveled diagonally across the heartland to South Carolina, with darkness from the totality lasting only about two to three minutes in any one spot. With 200 million people within a day’s drive from the path of totality, towns and parks saw big crowds. Skies were clear along most of the route, to the relief of those who feared cloud cover would spoil this once-in-a-lifetime moment. “The show has just begun, people! What a gorgeous day! Isn’t this great, people?” Jim Todd, a director at the Oregon Museum of Science and Industry, told a crowd of thousands at an amphitheater in Salem, Oregon, as the moon took an ever-bigger bite out of the sun. “I’m about to fight this man for a window seat,” Lightfoot said, referring to a fellow NASA official. Hoping to learn more about the sun’s composition and activity, NASA and other scientists watched and analyzed from telescopes on the ground and in orbit, the International Space Station, airplanes and scores of high-altitude balloons beaming back live video. Citizen scientists also planned to monitor animal and plant behavior as day turned into twilight. Thousands of people streamed into the Nashville Zoo just to watch the animals’ reaction. The moon hasn’t thrown this much shade at the U.S. since 1918, during the country’s last coast-to-coast total eclipse. In fact, the U.S. mainland hasn’t seen a total solar eclipse since 1979 — and even then, only five states in the Northwest experienced total darkness. The path of totality passed through 14 states, entering near Lincoln City, Oregon, at 1:16 p.m. EDT, moving over Casper, Wyoming; Carbondale, Illinois; and Nashville, Tennessee, and then exiting near Charleston, South Carolina, at 2:47 p.m. EDT. Shawnee National Forest in southern Illinois saw the longest stretch of darkness: 2 minutes and 44 seconds. Thanks to Lorre Black, residents enjoyed a Great American Eclipse party Monday complete with music and way to view the event live. Black said she was surprised at the turnout and thankful residents took time to come together for this historical day. https://www.recordherald.com/wp-content/uploads/sites/27/2017/08/web1_20170821_141626.jpgThanks to Lorre Black, residents enjoyed a Great American Eclipse party Monday complete with music and way to view the event live. Black said she was surprised at the turnout and thankful residents took time to come together for this historical day. Video Caption: Lorre Black, Black Sky Project Organizer, thanks the community for coming together to celebrate the historical Great American Eclipse.